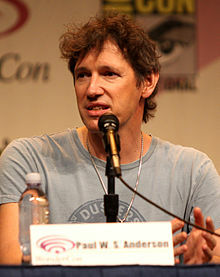 Paul William Scott Anderson (born 4 Mairch 1965) is a Inglis film director, producer, an screenwriter who regularly wirks in science feection movies an video gemme movies. He is primarily kent for directin, producin, an writin the Resident Evil films, which are based on the video gemmes o the same name. This page wis last eeditit on 19 November 2015, at 02:29.